This article covers the installation and maintenance of Pre-wired Feeder Pillars & Retractable Power Pillars as distributed by Thorne & Derrick and manufactured by Lucy Zodion. This article is to provide assistance to the end user in the installation, maintenance and operation of their feeder pillars – it is not exhaustive and a suitably qualified person should be consulted if in any doubt. It is important to note that any modifications made to the pillars without authorisation by Lucy Zodion are outside the scope of this article. Lucy Zodion supply two types of retractable power supply feeder pillars namely ‘Castle’ and ‘Westminster’ types – these feeder pillars are part of the Lucy Fortress range of Low Voltage Electrical Distribution Equipment. 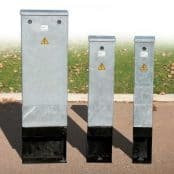 These feeder pillars mount flush to the top paving surface when not in use and are pulled up for use when LV power supply is required. Feeder pillars typically supply low voltage power sockets for supplying temporary power to events such as markets, outdoor events and broadcasting. 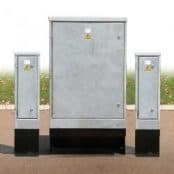 Pillars are available in a variety of specifications, including single and three phase electrical connections and data sockets, as specified by the end user. This Blog written with the support of Lucy Zodion should be read in conjunction with BS 6423:2014 (this replaced BS 6423:1983), the Code of Practice for maintenance of LV electrical switchgear and control gear for electricity voltages up to and including 1000V/1kV. All electrical work should be conducted in accordance with the Electricity at Work Regulations 1989. All feeder pillar installations should be designed, tested and installed in accordance with the IET Wiring Regulations BS7671 Requirements for Electrical Installations – any other local regulations in force at the time should be observed. Prewired pillars can be mounted either on the supplied metal root, which is buried in the ground see Figure 1 below, or bolted directly to a concrete base. Lucy Zodion do not specify the exact nature of installation as it is the customer’s duty to consult a suitably qualified civil engineer for feeder pillar installation. ➡ It is the customer responsibility to ensure the suitability of the site for the feeder pillar unit specified. doors of the feeder pillar to leave a safe installation with low visual impact. Figure 2 below is supplied for guidance only and a suitably qualified civil engineer should always be consulted to determine the exact method of installation. It is crucial that the unit is equipped with suitable drainage. Lucy Zodion recommend using a 100mm drain pipe with positive drainage to the main sewer. While the low voltage installation is IP67 rated, incorrectly replaced caps and covers allow opportunity for ingress of water and long term exposure can permanently damage to internal components of the feeder pillar. Westminster Retractable feeder pillars are supplied with recess pockets of a suitable depth for the proposed infill material. This depth is specified at order. Infill material must be installed flush with the surface and around the lock cover and hinges. Some means is necessary to hold the material in place when the feeder pillar is in the vertical, raised position, e.g. solvented grab adhesive. Pre-wired feeder pillars and retractable power pillars are supplied pre-wired and tested at Lucy Zodion’s factory. A copy of the test documentation, along with a schematic drawing of the Lucy Zodion supplied equipment, is supplied with the pillar. It is assumed that electrical installation is conducted by a suitably qualified and skilled person and the following information is for general guidance only. ➡ A full test in accordance with BS7671 must be carried out, and a certificate issued, by the installing party after installation on site. Feeder pillars are typically supplied with a single phase 230V or 3 phase 415V electrical power supply feed from either a DNO/REC or private supply. Suitable space has been left for installation of DNO/REC cut-out if specified; this can be verified with reference to the drawings supplied with the pillar. 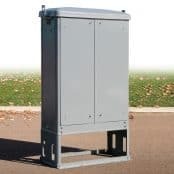 DNO/REC power supplies are connected to the pre-installed equipment using the pre-wired double insulated tails from the main switch disconnect. Private supply feeder pillars are wired into the equipment using the customer’s cable. The cable may be wired and connected directly into the main switch disconnect, wired through a cable spreader chamber or wired into a terminal enclosure depending on the size of the incoming cable. The provision for terminating incoming cable can be determined from the drawings that accompany the feeder pillar or identification of the parts on the pillar. As feeder pillars are often located remotely from the electrical equipment they supply the outgoing cable sizes often have a large cross-sectional-area for the current rating and cannot be terminated directly into the pillar equipment. For large outgoing CSA cable sizes suitable cable termination equipment, terminal studs or blocks, are supplied pre-wired into a terminal box. Incoming and outgoing cables should be wired into these terminals, if supplied, to avoid overcrowding on the main distribution board or where equipment is unable to accept cables of the size specified. Smaller cable sizes can be wired directly onto the equipment as appropriate. 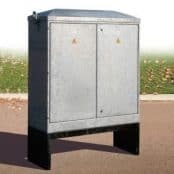 Suitable space has been left for the cable glanding of outgoing unarmoured or armoured cables, in the form of cable gland plates on the distribution or terminal enclosure, a cable spreader chamber or a horizontal length of galvanised trunking. 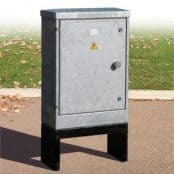 A dedicated ten way, brass earth block with an adjacent label reading ‘SAFETY ELECTRICAL CONNECTION, DO NOT REMOVE’, is supplied in a prominent and easily assessable location on the feeder pillar backboard. The pillar and all accessible metal parts within the pillar and all CPC earth in pre-wired equipment are equipotentially bonded to the earth block. It is essential that pillars are connected to a suitable earth upon installation. Retractable feeder pillars are supplied with a terminal enclosure mounted in the fixed base of the unit and attached to the outgoing circuits via a pre-installed flexible cable. Once cable terminals have been connected and appropriate tests conducted the supplied Magic Gel should be used. In all cases the installation must be connected to a suitable earth supply. The installer should check the earth loop impedance of the installation as this cannot be verified at the factory. Unsupported lengths of cable should be kept to a minimum. Where there is more than one cable they shall be connected along their length at not more than 1 metre intervals. This section covers standard equipment often supplied pre-wired into Lucy Zodion pillars. For special equipment not covered in this manual please contact Thorne & Derrick. All pre-wired pillars are supplied with isolation devices which can be locked off. It is essential that the supply is isolated before any covers are removed from enclosures. For work to be carried out on the incoming terminal board or switch disconnect it is necessary to isolate the supply coming into the feeder pillar. Switch disconnect isolates the main incoming supply from the rest of the equipment in the feeder pillar. 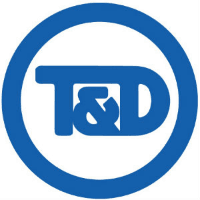 Switch disconnects may be SP & N, TP & N, SP&SN or TP &S N as required by the customer. In cases where a switched neutral is installed the live phases always cut out first when the switch is disconnected. All main isolators are capable of being locked off to allow safe working on the equipment. It is essential to lock-off the device when working remotely from the pillar, for example double sided or double length feeder pillars, or equipment being supplied from the pillar. Switch disconnects may be Fuse Combination Units which are suitable for making, breaking and isolation. The correct fuse for the device is installed prior to the unit leaving the Lucy Zodion factory. Should the fuse require replacement it is essential that the correct rating of BS88 HRC fuse is fitted. The switch fuse can be locked-off to isolate the rest of the system from the incoming electrical power supply. 24 Hour Board provides a continuous, overload protected supply to electrical equipment within installation. Usually this supply is the main panel board or fuse board of the installation. In cases where the main board is group switched an auxiliary board will be supplied to supply 24 hour power the pillar equipment (e.g. light, heater and socket) and the group switch control equipment. Socket outlets for use by normal persons are supplied as standard via an overload protected, residual current device, e.g. RCBO, RCCD on the 24 Hour board. Periodic testing of this device is required via the test button on the unit. Group switch controls a group of equipment, typically street lighting installations, via a control system, such as a photocell or timer. Be sure to isolate a group switch from the incomer on the 24 Hour board, as group switches are remotely controlled they can go live at any time. Group switch control – the group switch can be controlled by a timer, photocell or an override. A typical installation with a group switch would control street lighting. Solar Time Clock – is pre-set in the factory for the final geographical location of the pillar. To override the time switch press and hold the two central buttons on the controller until the output condition of the unit changes in the display. Photocell – either one or two part, switches the group switch contactors when ambient light levels fall below pre-determined level. One part photocells have the sensor mounted on the side of the pillar as standard. Two part photocells allow the installer to install the sensor head remotely from the pillar, the terminal from the photocell are wired into the unit in the pre-mounted 125x125mm enclosure within the pillar. Residual current devices all socket outlets are protected by a residual current device as well as suitable overload protection. 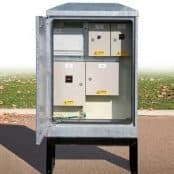 It is the end users’ responsibility to ensure that all equipment connected to sockets within the feeder pillar is within the specified load and connected by a suitable cable as required by BS7671. All residual current devices should be tested periodically and at least every six months. 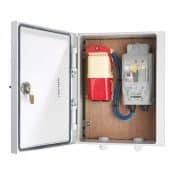 Surge protection devices are installed, if specified, to suit the earth system indicated by the customer e.g. TT or TNS. Should the earth system change from the original specification it will be necessary to change the surge protection device. The surge protection device has an end of life indicator based on the amount of KVA diverted to earth. This requires periodic inspection. Should the device indicate an end of life condition the unit will need to be replaced by a competent person. Raising and lowering: – the unit is unlocked using the supplied T key. The key is inserted and twisted through 90 degrees. The key is held in the lock and is used as a handle to pull the top cover open. The socket unit is raised using the handle on the top and locked into position using the two retractable lugs. The cover is subsequently lowered back into position. The socket box is fitted with a tilt switch which switches on the supply to the unit as it is raised. The LED on the top of the box indicates that the power is connected. Plugs are connected into the sockets by rotating the cover anti-clockwise until it is released and able to swing up. The sockets are functionally switched using the toggle switch on the RCD. ➡ To maintain the IP rating of the unit all caps must be properly replaced on the sockets and the RCD cover fully tightened before the unit is lowered after use. Lowering is the reversal of opening. Functional switching for sockets is provided by the isolation switch on the RCD. The transparent plastic cover provides ingress protection to the residual current devices. To access the switches rotate the knurled thumbwheels anti-clockwise until the bolt exit the hole and pull down the flap. Sockets are activated by pushing the switch into the up position. Test the functioning of the residual current device at the time of switching. This is achieved by pressing the test button, upon which the power should instantly be cut and switch revert to the down position. It is essential that the transparent cover is closed while the pillar is in use in order to avoid possible contact between water and electrical parts. Retractable power pillars are fitted with cenorm style outdoor sockets with a minimum ingress protection of IP67. the labels on the socket cover. Sockets and plugs of different types are not interconnectable and only plugs that match the current and phase rating of the socket should be plugged into it. To open socket covers, rotate the grey outer wheel quarter turn and hinge the cover upwards. Holding the cover up, plug the plug into the socket, with the tang pointing downwards. The cover should locate with the raised lug on the socket to ensure security of installation. Removing the plug is a reverse of the process and it is essential to ensure all covers are properly replaced before lowering the power pillar. ➡ Warning: Feeder pillars may contain accessible live parts even when the unit has been isolated. Equipment covers should only be removed by skilled and authorised personnel. The following recommendations are for guidance only as the nature of the environment and the conditions of operation will have a significant influence on the maintenance schedule required. This document describes the routine maintenance requirements of Lucy Zodion Pre-wired pillars and retractable power pillars. It is assumed throughout that necessary precautions to render the apparatus safe to work on have been undertaken by suitably qualified personnel. Conditions of use will have a significant impact on the service intervals of the equipment and it is advised that when units are installed in adverse conditions such as coastal areas, areas of high pollution, very frequent switching of loads or areas accessible to the public, that the maintenance interval is reduced to ensure reliable and safe operation of the equipment. 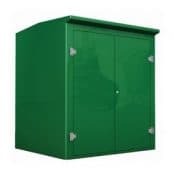 Under normal conditions of service, Lucy Zodion Prewired Pillars and Retractable Power Pillars are intended to give years of trouble free service. The best way to ensure trouble free service of your product is to conduct regular visual inspections and report any defects to a suitably qualified person for maintenance. As the retractable pillar is located below ground level, it is recommended that the adjacent area is kept clean around the lock mechanism. Only skilled and instructed persons may remove covers from enclosures within the pillars. In order to avoid live working, installations should be isolated from the supply prior to maintenance within enclosures. General good housekeeping techniques, including the regular removal of any foreign bodies that have fallen into the tub are recommended as part of the maintenance programme. * Incorrect alignment with a suitable drainage point, or blockage to existing drainage pipework on retractable power pillars may cause the container to fill with water, therefore route cause for blockage should be remedied by technically competent persons. Socket caps fitted as standard are designed for compliance to IP67 rating, when correctly aligned and fitted. Please note that the socket caps incorporate a recess on the reverse face and in the folded flat position condensation may form in this recess which is released when unscrewing the cap, for socket connection, this has no detrimental effect on safety or performance. Should you require competitive pricing, delivery or any further technical support to enable to specification or purchase of feeder pillars please do not hesitate to contact us.